Fresh from the grove with a charming reminder of yesteryear! 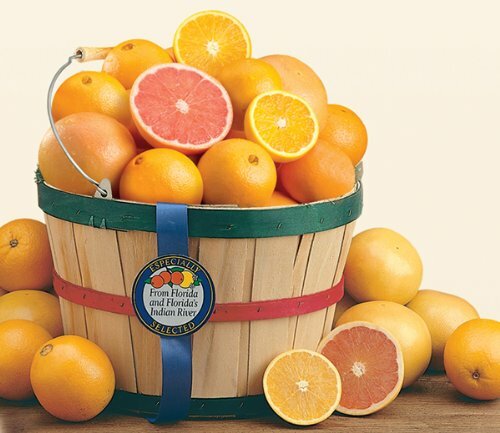 Our old fashioned basket is filled with plump Ruby Red Grapefruit, world-famous juicy Florida Navels. The absolute best tasting, juicy and sweet Florida Citrus available. Makes a great Christmas or Holiday gift! Order by December 16th for guaranteed delivery for Christmas! Suggestions on how much to order... For 1 person...2 fruit trays (approx. 20 lbs.) For 2 to 3 people...2-4 fruit trays (approx. 20-40 lbs.) For 4 to 6 people...3-4 fruit trays (approx. 30-40 lbs.) For more than 6 people...4 fruit trays (approx. 40 lbs. )* *4 trays is the best value, and you'll have plenty to share!